Domains of dynein. The large tail domain, which is not included in the atomic structure, is shown schematically based on its shape from electron microscopy. Our cells rely on three main types of motors to move things around, all powered by ATP. Myosin moves along filaments of actin, and is the engine that powers muscle contraction as well as many more molecule-sized transport tasks inside the cell. Kinesin and dynein move along microtubules, in most cases transporting their cargo in opposite directions along the tubule. Together, these tiny molecular motors make sure that everything is in the right place at the right time. Since it has so many moving parts, dynein has been difficult to study. The structure shown here, from PDB entry 3vkh , is the most complete structure so far. The entire motor is composed of one long chain that folds into many functional domains. The core of dynein is composed of a ring of six AAA+ domains, similar to the engines that power the unfolding of proteins in AAA+ proteases. One of these, the AAA1 domain colored dark blue here, is connected to a linker and a long tail (both in magenta). The tail usually connects two or three dynein motors together (depending on the particular variety), and attaches to the cargo that will be transported. The AAA4 domain forms a long stalk that carries a small mictrotubule-binding domain, supported by a short strut from the AAA5 domain. The details of the power stroke of dynein are still an area of active study, but many people see it as a nanoscale winch. Breakage of ATP in the AAA1 domain powers swinging of the linker domain, leading to rotation of the whole circle of AAA+ domains. But the long stalk isn't totally rigid, so it acts like a rope connected to the microtubule, dragging the cargo along as the motor turns. Microtubule-binding domain of dynein (yellow) bound to tubulin (blue). Researchers have explored the connection of dynein to microtubules using electron microscopy (PDB entry 3j1t ). 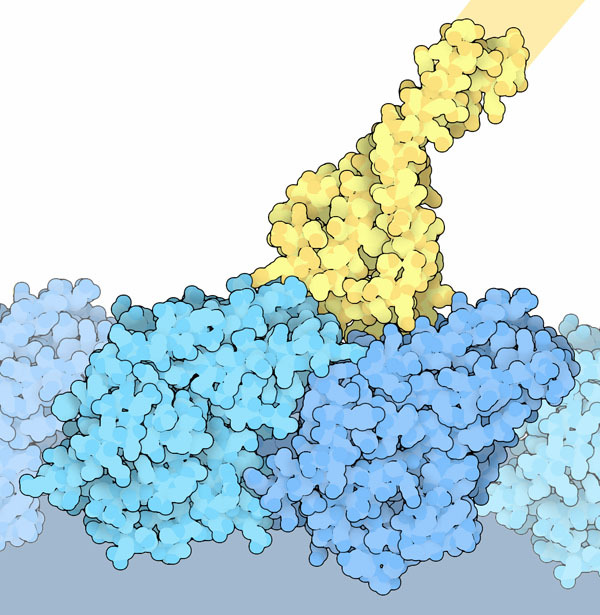 The entry includes one dimeric subunit of tubulin (shown in blues) and a short piece of the microtubule-binding stalk of dynein (in yellow). 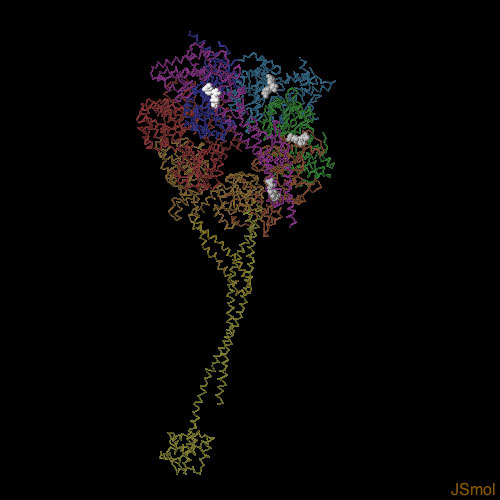 The structure shows that dynein binds in the groove between the two subunits. Dynein binds to four ATP molecules, but only one is involved in the power stroke, shown here at the top in white. The other three sites (shown in gray) are thought to play a regulatory role. To explore this structure in more detail, click on the image for an interactive JSmol. 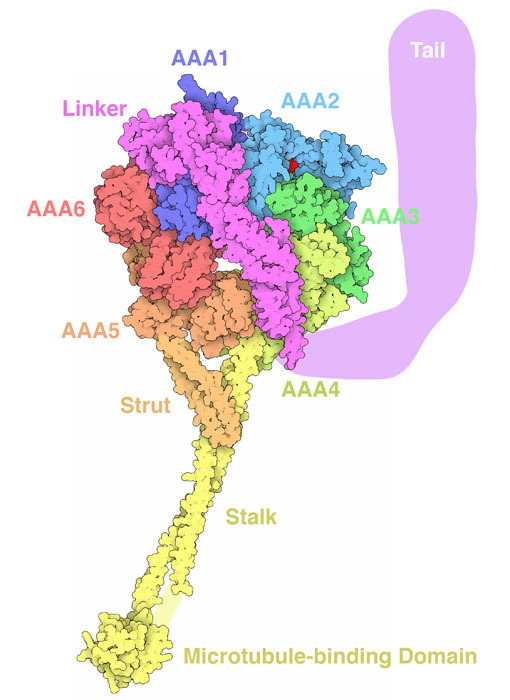 Many AAA+ proteins are composed of a ring of identical subunits, but dynein has all these subunits connected into one chain. You can compare, for instance, the structure of HslUV (a bacterial AAA+ protease) in PDB entry 1yyf.